Former Rangers director Paul Murray has claimed that the Ibrox side competing in the Third Division has led to a power shift in Scottish football. 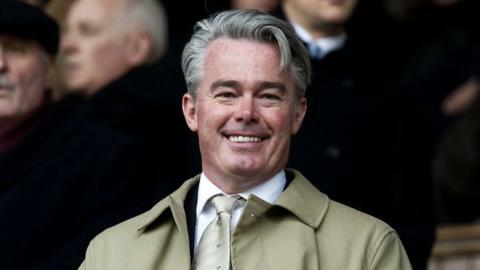 Murray, whose Blue Knights group led an unsuccessful bid to buy the club in the summer, believes the Scottish Premier League is less powerful than before. And he thinks more power has moved to the Scottish Football League with Rangers as a member club. "The dynamics of power have changed a bit from the SPL to the SFL," he said. "The SFL have now, perversely, got quite a bit of power because they have now got Rangers as one of their member clubs. And Murray believes that this power shift could lead to structural change in the Scottish game. "And I think that's what ultimately might actually lead to some change," he said. "Because of the fact you've then got two bodies who've got one half of the Old Firm in each of the bodies that might also lead to change that we think we need." The prospect of an expanded SPL emerged in a package of reforms put to Scottish Football League clubs just two days before their vote on admitting Rangers to the body. However, SFL clubs chose to admit Rangers to Division Three .